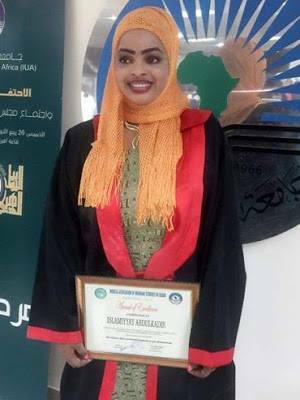 Dr. Islamiyat Oluwatoyin Abdulkadir, who had been orphaned since age six, has emerged the overall best graduating medical student at the International University of Africa, Khartoum, Sudan. 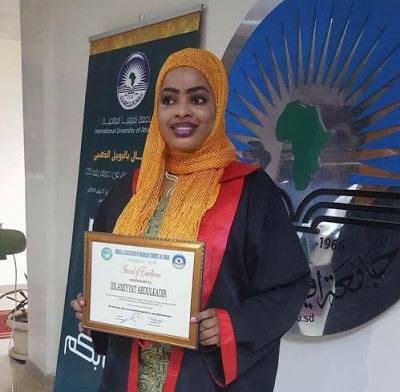 Abdulkadir, who spoke with the News Agency of Nigeria (NAN), in a telephone interview from Sudan, said her academic achievements so far, seemed like a miracle. “My academic achievement so far till today, seems like a miracle to me. Not only that, my life as a whole, is a pack of miracles,” she said. Abdulkadir said that her late mother, having lost her husband when she was barely three, enrolled her at the Ad-din International Group of schools to start her primary education. She said her mother later died when she was six years old. She was then in primary school and was left in the care of her grandmother, with no hope of furthering her education again. “Thinking that was the end of schooling for me, my grandmother withdrew me from the school but the founder, Alhaja Sekinat Adekola, gave me scholarship for my primary and secondary education. I emerged best student in my primary and secondary schools and even in my WASSCE and had a high score of 274 in my JAMB examinations. I have always had passion to be a medical doctor, but because I was not sure of my chances so I filled Bio-Chemistry in my JAMB form and came out with a high score of 274. This score was high enough to get me into the College of Medicine, University of Ibadan and with the hope of changing to medicine later. I had to jettison this dream because of the financial commitment involved in studying medicine. It was at this time that an admission team from International University of Africa, Sudan came to recruit Nigerian students into their school of Nursing. I presented myself for the written and oral interview and luck once again smiled on me as I emerged the best student and a scholarship was awarded me for my admission in their school of nursing. After the end of the first semester examination I emerged the best student, and the opportunity I had been waiting for presented itself. I approached the School’s Faculty of Medicine for a cross over from Nursing Faculty to Medicine, and the request was granted. So through thick and thin of financial difficulties, culture shock,hunger and loneliness, I braved it through and emerged the best graduating student, of the medical school on September,2, 2016. For me to clinch the overall best student, I had a CGPA of 3.37/4.00, making a ground breaking record in the history of the faculty by scoring above 3.24, the last highest grade,” she said. 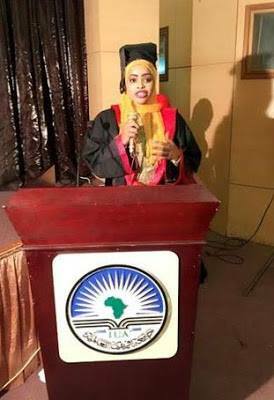 Abdulkadir said her graduation speech was full of emotions and gratitude to Almighty Allah, who brought her from nothing to something. She added that her dead parents would be happy in their graves with her achievements. “One certain thing I know about myself which can not be disputed, is that I am a living miracle of Allah. If you have searched for a proof of miracle but to no avail, look no further as I am here to testify to the miracles of God. I want to seize this opportunity to thank my God- send angels, Alhaja Sekinat Adekola, founder, Proprietress of AD-din International Group of Schools for the good background I got in the school. I also wish to thank my academic mentor, Dr. Adefemi Afolabi, Senior Lecturer and Consultant General Surgeon, Department of Surgery, College of Medicine, UI and UCH, Ibadan, Nigeria,” she said. Abdulkadir said one of her aims, was to give back to the society where she came from; Oyo state, Nigeria as a whole and most especially, the children. “I believe that the definition of success is incomplete without giving back to the society,” she added. Dr. Adefemi Afolabi, a Consultant General Surgeon and also the Chairman, Medical Advisory Committee, (CMAC), University College Hospital(UCH), Ibadan, said he met the young doctor on Facebook. “Mark Zuckerberg provided the medium Facebook, through which I accepted to be her mentor at a critical stage in her education career. I am proud to describe her as as my princess, daughter, mentee; I know she is meant for the top of her medical career. She told me she is highly motivated to give back to children who are growing up in difficult circumstances through her social entrepreneurial skills in the future. I enjoin all well meaning Nigerians and Philanthropists to reach out to many of the indigent students who are still struggling to accomplish their dreams of a better future,” he said. In a similar reaction, Alhaja Sekinat Adekola, the Founder of the Ad-din group of schools and also the Iya Adinni of Yoruba land said all glory should go back to Allah. “I am happy to be part of her success story through the grace of Allah. I charge other less fortunate children to always accept their lot with Allah. They should be focused and determined in achieving their aims and purpose in life ; Islamiyah was very determined to make it in life and she is making it. International women join the Nigerian women in congratulating Islamiyah Abdulkadir in achieving this feat. Also your alma mater, all Addinians and Addinites, join me in felicitating with you in this land mark of yours. My gratitude goes to Dr Afolabi, the CMAC of UCH, for his fatherly role throughout her stay in the medical school. I hope she will be lucky to be absolved in the UCH as a doctor after passing all required examinations necessary for her to practice as a medical doctor in Nigeria,” she said. Alhamdullillah Robil Alameeen. This is just too awesome to comment on. God is the father to the fatherless and the mother to the motherless. May God continue to bless, guide and guard this young, beautiful lady. Woooow!!! I feel soo proud of her and I dnt even know her. God bless u woman! Your parents will surely be happy! Congrats girl. It’s nice to see stories as such. God bless you and those who have surrounded you with love and a thriving environment. And as a fellow Addinian I say big congratulations to you Islamiyah. Please, keep the flag flying- we are very proud of you and to Iya Adinnta (as we used to fondly call her) may almighty Allah bless you and all your children. I remember that you sponsored lots of orphans back then, almost all the orphans living in the FOMWAN orphanage attended Addin. A big thumbs up to that woman that gave a little orphan girl a chance. Did not abuse or use her. Her own children will never want for anything. Very inspiring story. Honestly, that woman is a big inspiration. Amen o!!! This story has inspired me to find a child in need and sponsor their education. God bless her!! congratulations! you have Overcome odds stacked against you. who would haVe thought war torn Sudan offered more opportunity than stable and resource rich Nigeria? went hear your story i flee so in dempted to you… may Allah make you to help others like you ……. pleased can i have your digit…..